The Crystal City Twilighter 5k‘s seventh running was a who’s who of the regional running scene. Area running clubs emptied their stables. The course was new – faster, with fewer turns. And conditions, while not good for racing, exactly, were about as good as they get for late July in downtown Arlington. No 98 degrees (2011) or downpours (2013). Kwiatkowski was followed by Pacers-New Balance teammates Landon Peacock (14:47), Leoule Degfae (14:50), and Frank Devar (14:51). Kevin McNab, in 14:55, was the fifth and final runner under 15 minutes, leading Georgetown Running Club to second in the team standings. GRC was followed by DC Road Runners Club, Northern Virginia Running Club, and Capital Area Runners. Last year, Claire Hallissey led Gallagher through a too-quick first mile. Gallagher faded to third, she recalled. At the three-mile mark, Gallagher finally gave in, while Laskowske still finished just three seconds back. Lindsay O’Brien, of Georgetown Running Club, was third in 17:56. “It was really good to kind of go in with a better plan and be a little more conservative,” Gallagher said. Kwiatkowski and Gallagher each earned $200 for their efforts. The top three teams each received $250. In the masters division, Patrick Kuhlmann, 43, won in 16:12. Shannon Smith, 48, was top female master in 21:20. “I’m the old guy,” the unassuming Kuhlmann, said, as a way of identifying himself at the award’s stage. He took the same honor last weekend at the Rockville Twilight. If you think racing in the summer can be tough, try two in one day. That’s what Mike Cannon, 56, of Fairfax Station, did as part of his quest to run more than 100 races in 2014. Andrew Gray and Alan Bornbusch, two Arlington runners and members of one of Pacers’ Tuesday night running groups, enjoyed the race, they said, though perhaps for slightly different reasons. Bornbusch, 53, said his 22:39 finish served him well in training for his first half marathon this fall. “It’s a nice little piece of speed work,” he said. For Gray, 31, who came in just a few seconds shy of breaking 20 minutes, the race was more like a piece of cake, even if a head cold made it difficult. After years of trying, Arlington’s Matt Deters broke 16 minutes by a clump of hairs – 15:58. He confirmed his time at a laptop at the registration table. He was close on the fourth of July, running 16:06 at the Firecracker 5k in Reston. At Crystal City, he split 4:49 and 10:03 before hanging on as the heat, and the hurt, turned up. Look out for Thomas Edison High School’s cross country team. The Edison Club won its second-straight title in the high school team competition. Gonzaga, Annandale, Wilson, and J.E.B. Stuart also fielded clubs. The Walt Whitman Club won in the high school girls division, followed by Annandale, Lake Braddock, Wilson, and Georgetown Visitation. 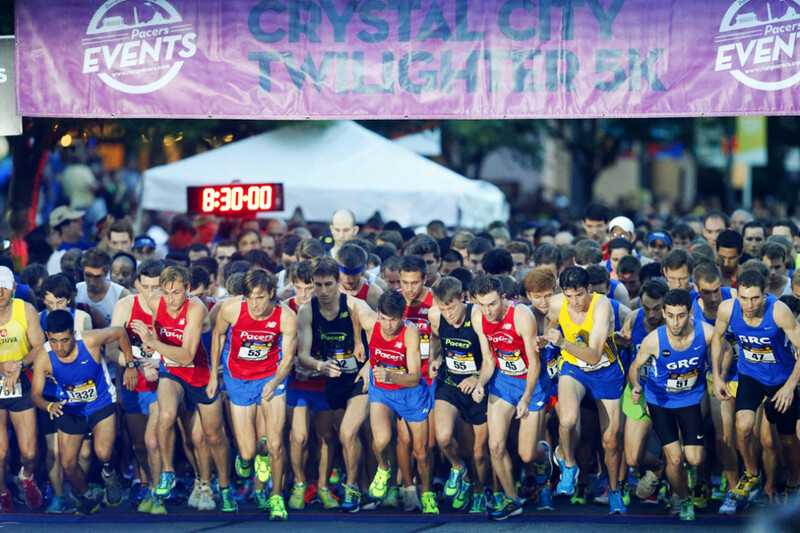 Brandon Rockers, a rising senior at Edison who was third for his club in 17:47, said running the Crystal City Twilighter has become a team tradition. “The race has always been before a running camp” members of the team attend, Rockers said. In the high school results, Aviad Gebrehiwot, 17, of Annandale High School, was top male in 16:44. Sonya Butseva, 16, and teammate Kate Murphy, 14, both running for Lake Braddock Club, were the top females, both finishing in 20:49. Look out, as well, in the 11 to 14 age group. Madalyn Wright, 11, was 3rd in the female division behind Murphy and Angelica Gaughran, also 14. Her time was 22:57. Wright was wearing a tutu, and said she has now run about half-a-dozen races between 5k and 10k. “I love running,” said Madalyn, whose mother, Myra Wright, ran in high school and is a longtime runner. That’s how it has been ever since, said Wright, who had a finishing time of 24:16 on her watch.